Another project for the apartment, one of my room mates printed 96 photos, so we stuck most of them onto this wall. Tie twine to one push pin, and place in wall. Take second push pin and use the twine as a guide to make sure the second pin goes in straight across the wall. Tie end of string tightly to second push pin. 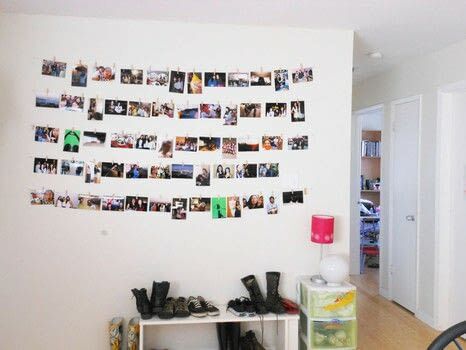 Add photos, hanging them off the string with mini clothespins. Repeat! Don't add new lines underneath until after you hang up the photos from the line above it. The photos and pins will make the twine sag a bit, so it may come out uneven if you do all the lines before adding photos. .